How many of you remember a candy called Cracker Jack? You bought Cracker Jack because you wanted the caramel-coated popcorn. But you always got something extra -- the free prize inside. That's kind of the experience one of our clients, SWBC, got. SWBC tracks insurance coverage against collateral such as houses and cars for financial institutions including banks, savings and loans, and credit unions. They have over 4 million policies to track. They came to HardMetrics because they needed to improve client reporting and internal analysis and reporting. But after implementing HardMetrics Performance Manager, they got more than they bargained for. They discovered that they could use it as a motivational tool too. SWBC uses the data from HardMertics Performance Manager to display the Company's forecast and goals to show if they're operating in green, red, or yellow territory. Now everyday, service center employees check to make sure they’re in the green. And if they’re not, then there's a little more pep in their step that day. HardMetrics also played an analytical role in helping SWBC identify a transformational acquisition. They performed a multiple process analysis to compare their three OCR platforms using HardMetrics as the measurement platform and comparative litmus test. Its analysis helped SWBC acquire a new company. We put together a case study drilling into each of the new functions SWBC uncovered in HardMetrics Performance Manager. You can keep reading to find out more, or download the jazzed up PDF. What started as a search for a more sophisticated reporting solution results in SWBC deploying advanced operational analytics. Managing workflow, motivating employees, and even comparing performance across different operating platforms, occurs organically as a result of robust new analytical solutions. Provide clear metrics to customers demonstrating performance against contractual service level objectives (Client Reporting). Motivate service-center employees to meet service-level objectives (Internal Analysis and Reporting). Crack the code: Move beyond cumbersome system queries and manual report generation from a stable but rigid mainframe computing platform to full automation with self service features. Track insurance coverage on over 3 million auto loans and over 1 million mortgages for 300 financial institutions. Determine which of the three deployed document processing platforms delivered the best performance against service-level objectives. 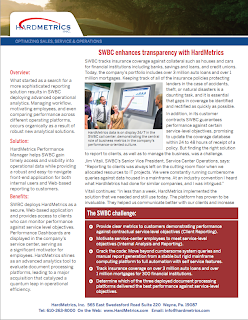 HardMetrics Performance Manager helps SWBC gain timely access and visibility into operational data while providing a robust and easy-to-navigate front-end application for both internal users and Web-based reporting to customers. SWBC deploys HardMetrics as a secure, Web-based application and provides access to clients who can monitor performance against service-level objectives. Performance Dashboards are displayed in the company’s service center, serving as a significant motivator for employees. HardMetrics shines as an advanced analytics tool to evaluate document processing platforms, leading to a major acquisition that catalyzed a quantum leap in operational efficiency. SWBC tracks insurance coverage against collateral such as houses and cars for financial institutions including banks, savings and loans, and credit unions. Today, the company’s portfolio includes over 3 million auto loans and over 1 million mortgages. Keeping track of all of the insurance policies protecting lenders in the case of accidents, theft, or natural disasters is a daunting task, and it is essential that gaps in coverage be identified and rectified as quickly as possible. In addition, in its customer contracts SWBC guarantees performance against certain service-level objectives, promising to update the coverage database within 24 to 48 hours of receipt of a policy. But finding the right solution to report to clients, as well as to manage the business, was a challenge. In the analytics arena, SWBC operating managers can quickly see red flags, drill down to identify the customer that’s being impacted, and dig even further to find out what is causing the shortfall, or even who is responsible for it. HardMetrics also played an unexpected analytical role in helping SWBC identify a transformational acquisition. Optical character recognition is a significant operation at the company. When a borrower mails or faxes an insurance certificate, the name of the game is to get that new insurance information processed as quickly as possible. SWBC wanted to compare processing times between three different platforms: A totally manual platform; a traditional template-based OCR platform; and a fourth generation, template-less integrated OCR system developed by a start-up company. The results were eye opening. “We performed a multiple process analysis to compare the three OCR platforms using HardMetrics as our measurement platform and comparative litmus test. It was glaringly apparent that the fourth generation platform was much more efficient,” says Vitali. “With the analysis performed within HardMetrics we realized that we had to own the technology, and made the strategic decision to acquire the company that developed it. Before, I had 45 full-time employees working to process insurance on 2.5 million loans. Today, I’m processing insurance for over 3 million loans and I have 16 people -- about a third of what I had before -- and I am consistently operating within service level objectives."